Come out and support a very fashionable fundraiser to benefit Trinity Prep’s Ellis Award for International Travel. Shop the latest holiday collections and watch Trinity Prep students showcase their best travel looks on the runway! The fashion show starts at 2 p.m. Enjoy special savings on almost all purchases during Bloomingdale’s Friends and Family event. 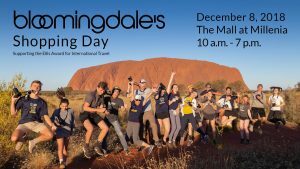 Plus, Bloomingdale’s Orlando is pleased to donate 10% of supporters’ tracked sales back to the Ellis Award for International Travel. Visit Trinity Prep’s check-in table on level 2 to receive a copy of the barcode and a raffle ticket for a chance to win a gift from our prize drawing. * Barcode is also available at registers.